Over shoes and overboots fit conveniently over your everyday work shoes and are made to protect against liquids, dust and any other form of contaminates. Shop our selection of shoe and boot covers from Tingly and OnGuard that are available in various styles, materials, sizes, and colors. Find the right shoe or boot cover that fits your application today. When choosing which rubber boot over shoes will best suit your needs, consider the following in determining what your work environment is like. What types of chemicals or solvents will my feet be exposed to? Are there any sharp objects that could harm me? Is the temperature extremely cold? Now that you have a general idea of what your work environment is like, you can easily asses which shoe or boot cover is ideal for you and they are available in three different materials. 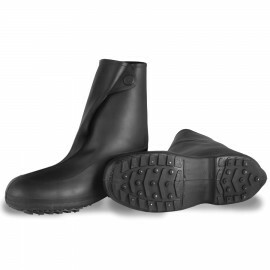 Natural Rubber - This material has an outstanding stretch for easy on/off of the boot and excellent low temperature properties allow the material to stay supple in cold temperatures. In addition, it has slip, puncture, and cut resistance, compared to that of PVC material. 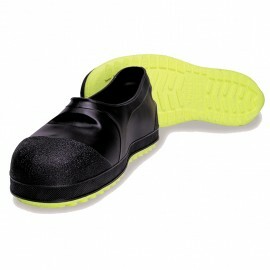 Natural Rubber will resist bases, acids, alcohols and diluted water solutions of most chemicals that are water-soluble. However, it will not withstand constant contact with petroleum and oil based solvents. Neoprene - This synthetic rubber material will resist a broad range of animal fats and blood, oils, certain acids, alcohols, alkalies, caustics and certain solvents. It is, however, less resistant to cut, punctures and abrasion than natural rubber. PVC - Polyvinyl Chloride, is a synthetic thermoplastic polymer that provides users good protection against animal fats, many acids, alcohols, alkalies, bases, oils and petroleum hydrocarbons. However, PVC is not recommended for use in ketones, aldehydes and many solvents. PVC has a good stretch for easy on/off and low temperature properties. 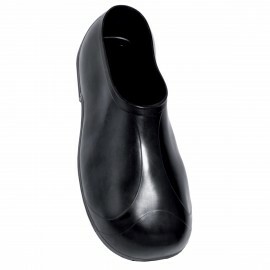 Also available are steel toed shoe covers that provide instant protection. 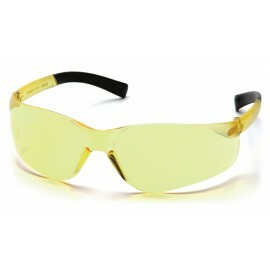 It's perfect for professionals working around heavy objects that could potentially fall on their feet. 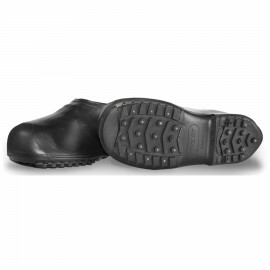 Steel toes offer a great deal of protection for your toes. Steel toe boot over shoes also offer resistance to fats, certain acids, hydrocarbons, caustics and are 100% water proof. 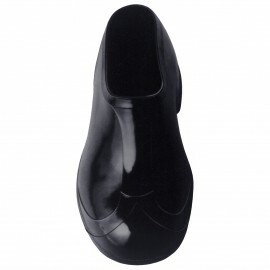 These PVC boot over shoes exceed ASTM F2413-05 requirements for impact and compression resistance. Rubber boot over shoes should be considered for the following occupations according to OSHA's 1910.136(a) guidelines; shipping and receiving clerks, stock clerks, carpenters, electricians, machinists, mechanics and repairers, plumbers, assemblers, drywall installers and lathers, packers, wrappers, craters, punch and stamping press operators, sawyers, welders, laborers, freight handlers, gardeners and grounds keepers, timber cutting and logging workers, stock handlers and warehouse laborers.